MONCTON, N.B. 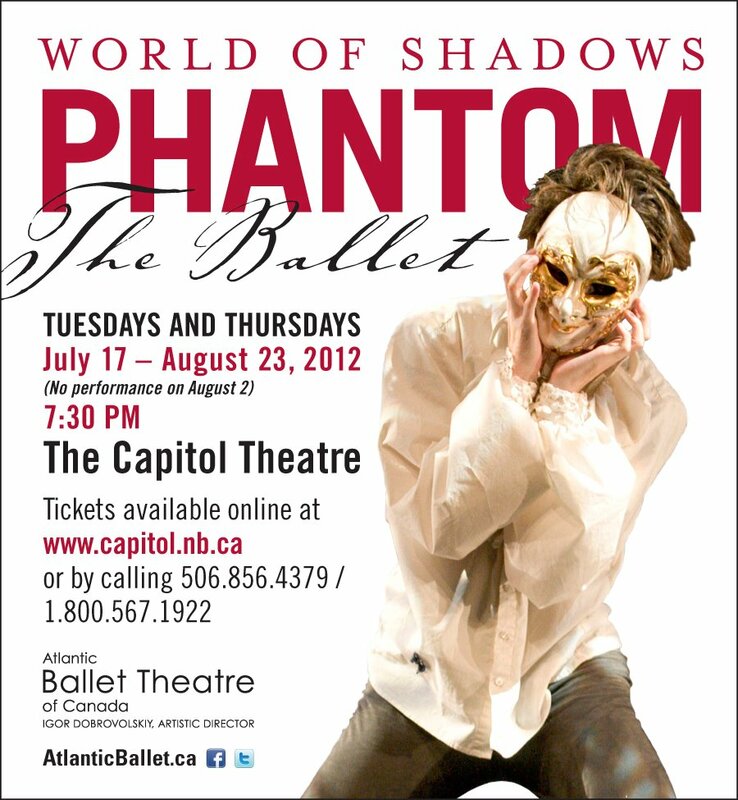 – The Atlantic Ballet Theatre of Canada announced today that its summer production of World of Shadows – PHANTOM, the Ballet will return to Moncton’s Capitol Theatre for 12 exciting performances on Tuesdays and Thursdays between July 17 and August 23. The announcement was made today at a unique masquerade reception held at the Atlantic Ballet Theatre’s studio in Moncton. “We encourage everyone to support this production and share it with others. Everyone should take the opportunity to see this tremendous ballet,” Mayor LeBlanc said. The Atlantic Ballet Theatre of Canada is partnering with the City of Moncton, Downtown Moncton Centre-ville Inc., the Greater Moncton Chamber of Commerce and Enterprise Greater Moncton to bring PHANTOM back to the Capitol Theatre. Summer presenting sponsor is McInnes Cooper, while Grant Thornton continues its long tradition as a founding sponsor for the company. “I am delighted to announce that for every ticket sold to PHANTOM this summer, $2 will be donated to the United Way campaign of Greater Moncton. Our government is immensely proud to see these initiatives taking place, because it shows that you – Atlantic Ballet Theatre – are as committed as we are to rebuilding New Brunswick together,” Minister Stulz said. According to a major study conducted for the Department of Canadian Heritage and Industry Canada and titled The Economic Impacts of Cultural and Sport Tourism in Canada in 2007 (prepared by The Outspan Group Inc. Amherst Island in association with Research Resolutions & Consulting Ltd., Toronto), the gross domestic product derived from cultural tourism in Canada in 2007 amounted to more than $5.1 billion and produced labour income of almost $3.3 billion. Receipts for cultural tourism amounted to $8 billion. Cultural tourism alone generated over 110,000 full-time jobs. It is clear that an investment in cultural tourism initiatives have a substantive economic impact. “This ballet has sold out every one of its Canadian and European performances,” said Norm Raynard of Grant Thornton, a major benefactor of The Atlantic Ballet Theatre of Canada for several years. “Grant Thornton recently renewed our support as Founding Sponsor of the Atlantic Ballet Theatre for another five years, bringing our investment in the company to $600,000 – a wise investment in our cultural community and our local and provincial economy,” Mr. Raynard said. “From our perspective at Grant Thornton, the Atlantic Ballet Theatre IS good business by representing our city, province, region and country on the international stage,” he said. Chris Borden of McInnes Cooper said that as Summer Presenting Sponsor for PHANTOM, his firm is proud to be a community partner in this cultural tourism project for downtown Moncton. “We want to see people put PHANTOM on their must-see list. Whether you’re visiting Moncton for just one day, a week or more, this is something not be missed,” he said. “The production will entertain and amaze you with beautiful choreography and acting, amazing costumes and music,” Mr. Borden said. Susan Chalmers-Gauvin, Co-founder and CEO of the Atlantic Ballet Theatre of Canada, said the ballet is an original interpretation of Gaston Leroux’s Phantom of the Opera and set to the music of composer Francis Poulenc. “The ballet has toured to sold-out crowds across Canada and Europe and we are thrilled to give the production a summer home here in Moncton for the second summer in a row,” she said. Mrs. Chalmers-Gauvin added that Atlantic Ballet Theatre of Canada is proud to be part of the downtown development and looks forward to strengthening the ballet’s role as a magnet for tourists in its second summer of performances at the Capitol Theatre. This year’s talented lineup of dancers for the 2012 summer production of PHANTOM is: Sergiy Diyanov (as Erik); Brian Gephart, Janie Richard, Kyle Davey, Samantha-Jane Gray and Yuriko Diyanova (as Erik’s Thoughts); Anton Lykhanov (as The Persian); Anya Nesvitaylo (as Christine); Olena Zakharova (as Prima Donna); Brian Gephart and Kyle Davey (as the Theatre Directors); Janie Richard, Samantha-Jane Gray and Yuriko Diyanova (as the People of the Theatre); and Leigh Alderson (as Raoul). Costume design is by Paul Daigle, an internationally known designer and former dancer with the Royal Winnipeg Ballet. Set designer Brian Perchaluk is a graduate of the University of Winnipeg and the National Theatre School of Canada. Lighting design is by Pierre Lavoie who has worked as a lighting designer since 1982. “World of Shadow’s” dramaturge is by Sharon Pollock, one of Canada’s leading contemporary English-language playwrights. Tickets for World of Shadows – PHANTOM, the Ballet are on sale now for $37.50 (plus CIF) for adults and $32 (plus CIF) for students and seniors and are available at the Capitol Theatre box office, 811 Main Street, Moncton, or by calling 856.4379 or 1-800-567-1922. Tickets are also available online www.capitol.nb.ca. Performances will be held on Tuesdays and Thursdays at the Capitol Theatre between July 17 and August 23. Curtain time is 7:30 p.m. The Atlantic Ballet Theatre of Canada is a contemporary ballet company dedicated to performing original works by one choreographer – Artistic Director, Igor Dobrovolskiy. Founded in 2001 by Mr. Dobrovolskiy and CEO Susan Chalmers-Gauvin, the company pursues a continuous creative process through collaboration with like-minded artists attracted by the vision and artistic philosophy of its Artistic Director. The company has performed throughout Canada, as well as in the United States, Belgium, Switzerland, France and Germany. For more information on the company, visit their website at www.atlanticballet.ca.